A different way to eat corn starch gummy candy in watermelon flavor with chili, Jelly Fire! With an intense & spicy watermelon flavor these soft gummy lollipops shaped like a watermelon are one of the best Mexican candies. 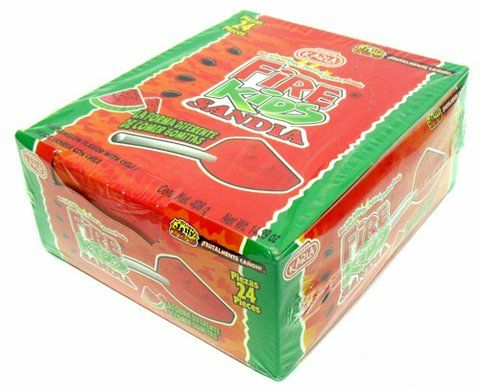 Fire Kids Sandia's spiciness is so fruity its intense!! Manufactured by Dulces Karla. Paleta de gomita picosita de Dulces Karla sabor sandia con chile. Fire Kids Sandia son paletas de gomita cubiertas con chile picoso sabor a sandia, con un sabor intenso y agridulce. Estas deliciosas paletas de gomitas son unos de los dulces mas ricos de Mexico. 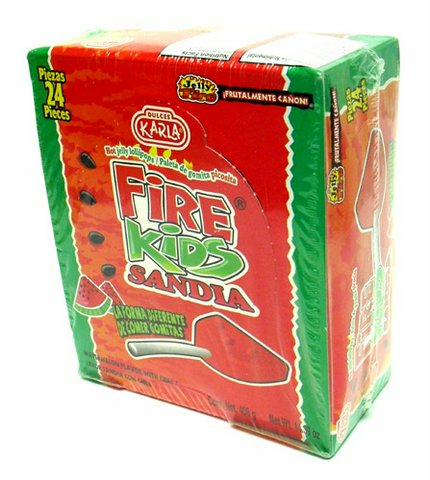 Los Fire Kids Sandia son tan picantes, que son frutalmente ca�on! Fabricado por Dulces Karla. Ingredientes: azucar, glucosa, almidon de maiz, agua, chile en polvo, sal, acido citrico, sabores artificiales y colorante artificial. I never really liked chili pops, all the kids eat them at my school. but a nice chewy watermelon gummy on a stick, it wasn't sugary sweet but just right. I recommend it to novice mexican candy eaters. Proswatermelon gummy (sweet but not overwhelming) mix of textures (chili powder+jelly pop) a good portion of candy for me...(17grams) im not a big candy eater so its perfect. ConsThe chili powder may be a lil TOO SALTY. some people my complain that its too small. after eating it, it makes you all hot and dry mouthed.